With 4 bedrooms and 2 lounges the house is ideal for couples, family or friends holidaying together. Private and sheltered backyard area with gas BBQ. Wonderful sunny deck and play area for the kids to play on the trampoline. We have modernised the property by installing new appliances we have gone to a great deal of effort to maintain the atmosphere of a family home. We hope we have created an environment ( house and garden) where our guests can really relax! Our rates include bed linen and towels and as long as you leave the property clean and tidy there are no additional cleaning fees. ( see special conditions). We are happy to offer early check ins and late check outs at no additional cost if our other bookings permit. Off street parking for 3 to 4 vehicles! Linen provided includes,Towels, Linen, blankets, duvets and pillows. Towels for swimming not supplied please bring old towels! Great location, close to lake and off main road so nice and quiet. Loved the outdoor space, was perfect for relaxing with a bit of shade. Would definitely recommend to others. House was fantastic, the highlight had to be the outdoor area/ deck great for summer BBQ's. House was fantastic, the highlight had to be the outdoor area/ deck great for summer BBQ's. Would highly recommend. A nice little house, but be aware that it is not a bach, its very much a family home. We stayed over a particularly cold weekend & we found it quite cold at night. 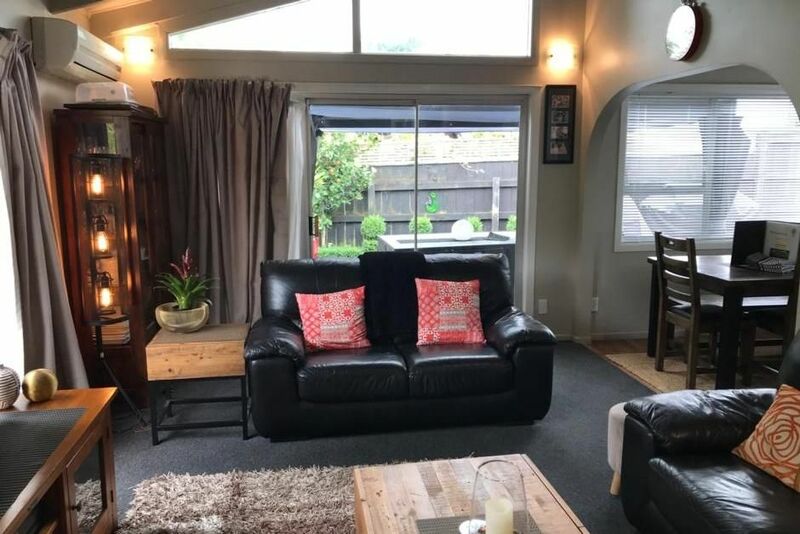 Absolutely correct the house is a family home which becomes a Bach over summer and on the odd occasion is rented out on some winter bookings, we have two homes side by side which are batches in summer. This group came from warmer North to a very very cold weekend in Taupo. The home is well equipped to heat the house, heat pump, fire, heat transfer kit and HRV, unfortunately as indicated was still too cold for guests, we do apologise your stay was not warm enough for you. ? ?